The Jobst® Stocking Donner is an exceptionally convenient compression stocking aid designed to help those with limited hand strength and dexterity put on their support wear and compression stockings. The compact size and weight make it ideal for travel and easy to store, while the durable epoxy finish ensures the Jobst® Stocking Donner will not snag or put runs in your compression stockings. Protect your hands and your Stockings, How To Use Jobst Stocking Donner: Step 1: Place your compression stocking aid inside the semi-circle frame and pull the top of the stocking down over the semi-circle. The heel of the stocking must face the back of the Jobst Stocking Donner. (Figure 1) Step 2: Continue to slide the stocking down over the semi-circle until the heel is centered and even with the top of the semi-circle. (It may be necessary to pull the heel farther down depending on foot and stocking size.) (Figure 2) Step 3: While sitting, insert your foot into the stocking until your foot is completely on the floor. Helpful tip: Hold the heel pocket against the frame as your slide your toes into the stocking. 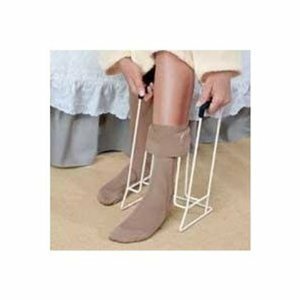 (Figure 3) Step 4: Grasp the padded handles of the Jobst Stocking Donner and gently pull the donner and stocking up the leg until the stocking is above the calf. Try not to overstretch the stocking (Figure 4) Step 5: Pull the Jobst Stocking Sonner backward and down, free of the stocking. (Figure 5) Step 6: Be sure the heel of the stocking is properly placed on the foot, then adjust the length and smooth out any wrinkles by stroking and smoothing with the palm of your hands Jobst Stocking Donner Returns: Due to the hygiene or rehabilitation nature of this product, it is non-returnable.